The growing trend in customizing and building RGB color-themed PCs has been one of the very key factors for most PC DIY enthusiasts making a decision in selecting their motherboards when creating a new system. 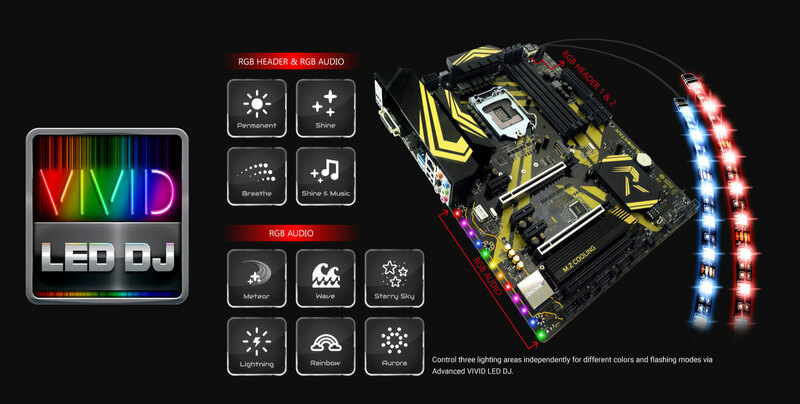 BIOSTAR has taken this into consideration when creating its new RACING Series of motherboards featuring the whole-new Advanced VIVID LED DJ, BIOSTAR's exclusive lighting control utility, with more LED flashing modes and lighting changes for the 3rd-gen RACING Series! 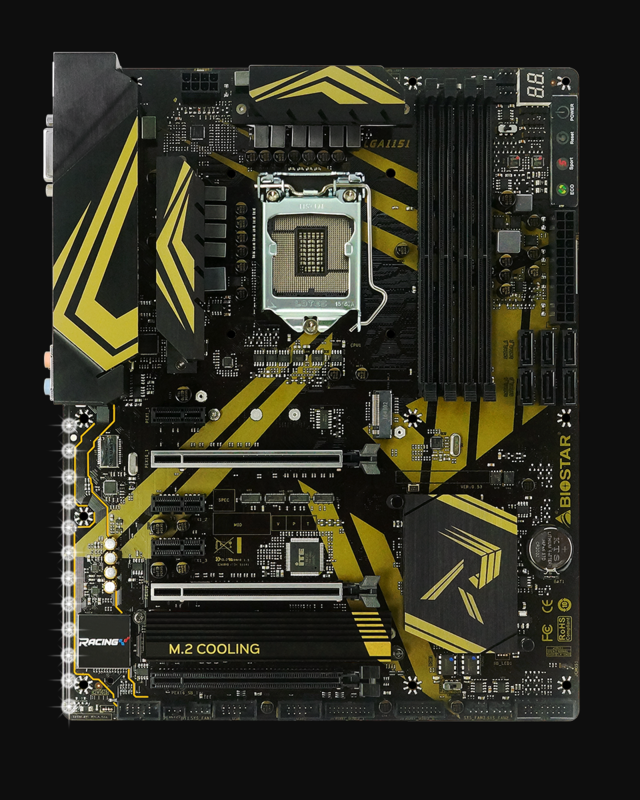 BIOSTAR revamps the 3rd-gen RACING Series motherboards with a much more flashy and high-end design with a gold and black color theme. 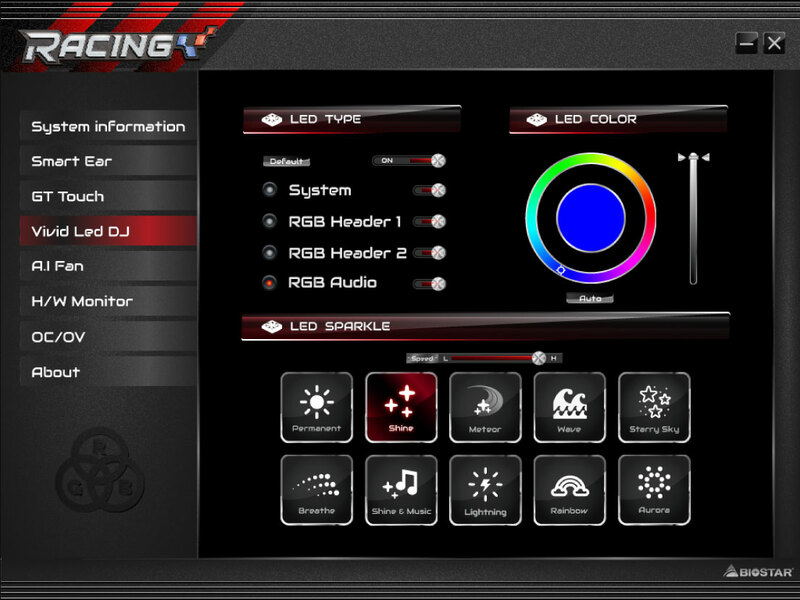 To complete the new RACING look, BIOSTAR adds more vibrant RGB LEDs with the all new Advanced VIVID LED DJ utility featuring more RGB lighting customization on multiple RGB LED zones of motherboards. RGB lighting enthusiasts can control literally splendid full-color RGB lighting effects to stand out their coolest personal style via Advanced VIVID LED DJ in tandem with onboard LED lights. Now you can build up your exclusive RGB RACING system to show strong personal style by Advanced VIVID LED DJ with more customizability and options to control three RGB LED lighting zones independently, including audio area and 5050 LED FUN ZONE with two 5050 LED headers. Users can control color, speed and brightness via 10 different flashing modes with ease. With more possibilities users can create unlimited creativity with 5050 LED FUN ZONE which comes with dual RGB LED header configured to install different LED products. LEDs gradually flash on and off. The 5050 LED FUN ZONE comes with two 5050 LED headers to bring more colorful lighting options to DIY lovers. RGB enthusiasts can fully enjoy DIY fun of creating their own systems with uniquely and strongly personal style with LED strip, RGB fan or any kind of LED product to adjust system color scheme by Advanced VIVID LED DJ utility. Now you can build up your exclusive RGB RACING system to show strong personal style by Advanced VIVID LED DJ with more customizability and options to control three RGB LED lighting zones independently,including audio area and 5050 LED FUN ZONE with two 5050 LED headers. Users can control color, speed and brightness via 10 different flashing modes with ease. With more possibilities users can create unlimited creativity with 5050 LED FUN ZONE which comes with dual RGB LED header configured to install different LED products.